Over the years there have always been people talking about building a list like it doesn’t matter, saying lists don’t matter, don’t waste your time building a list, etc… so why do you need a list? In the Traffic Exchanges, something like a lead capture page is a very low resistance method to get them in the funnel – they don’t have to remember to do anything, only have one or two form fields to fill out, and can do it while they are surfing without interrupting their flow — it’s easy for them to complete the goal of your page (fill out the form) and move on with what they are doing. Using a Lead Capture page is much more efficient than any other advertising method. With a splash page you are hoping someone clicks your ad, then clicks signup, then fills out a registration form… if they do all those tasks now you have generated 1 referral. If you are trying to build multiple downlines and it takes you 1k views to get a lead, you’re fighting a losing battle. If you are building a list and getting that same 1 lead out of the 1k views (you can easily get more, or less, depending on the effectiveness of the capture page), since you have that leads email address, you can sell them multiple products and turn that 1 lead into a referral or sale in several different areas. One of the biggest cases for building a list is on those rare occasions when a site closes up shop, or when they randomly decide to remove their affiliate program taking away all earnings from that business. 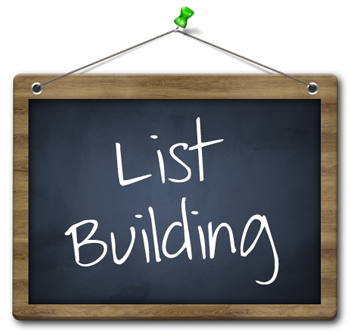 If you weren’t building a list, all of those referrals are just gone and that is it. With list building you have all their contact information and can simply contact them and move them to a different site with you. The key to having an effective email list, is getting your emails opened. If the only thing you do is send marketing messages, you will find you get very poor response. People learn to simply ignore your emails. The best way to get them to read your emails is pretty simple — provide value. If you send emails with just tips and tricks and valuable content, you’ll get your emails opened and people will even look forward to opening them. Providing this value not only gets your emails opened, but it also gets your downline active. If you are providing real value on how to use a product they purchased with you (ideally a monthly subscription) you are going to create more active referrals since they better understand the value of what you are selling, and the tips you provided to use it more efficiently. The easiest way to get an opt in, and provide value, is to give them a hook. Something simple like a free ebook or guide can not only provide as a targeting tool (pulling in people interested in a certain market), this is an easy way to get someone to jump in. One method I prefer is to create a series of 8-10 emails and then send them out every 3-5 days or a week. This way you can get people excited to receive your email and anticipate your next email, this is great for getting people in the habit of opening your emails. The key to getting someone to opt in is by reducing as many barriers to signup as possible – as little information as possible, just their email address and name is enough. Making it easier makes it more likely for people to do it. The main reason why splash pages are generally so inefective is because you are asking too much of a user. Most members are just trying to get their surfing done, asking them to do all these tasks (become interested in the ad, click the ad, read the sales page, click the signup, fill out a form to signup, then with any luck actually use the product). With a lead capture page you just have the form right there in the surf frame, they can easily put in their information and move on and continue what they are doing. You now have their time later to sell them when they aren’t busy or focused on another task. Your lead capture page can always be more efficient, the first step is just setting something up and having something out there, so you always want to be tweaking and testing things to improve your conversions. Something so simple as changing a background color can effect your conversion rates, so you always want to be using several different capture pages and creating new ones based on your best performing to make sure you are constantly increasing your conversion rates. When you are satisfied with the conversion rates of your capture pages, it becomes really easy just to scale the system up. If you get 5 opt ins per 1k views, then pump 100k views into it. It works the exact same way, but to a larger scale and since it’s an automated series it will not take any more work on your part other than the advertising and getting the capture page in front of people’s eyes so they can fill it out and enter your funnel. If you don’t have an email autoresponder service already, I recommend Traffic Wave. It takes a bit to set up but is the most cost effective and reliable autoresponder on the market. Most charge based on subscribers and it may seem like the low price point of an autoresponder is ‘good enough’ but the larger your list becomes, the more difficult it becomes to move and by the time you reach the higher price tiers, you often will find yourself ‘stuck’ there.